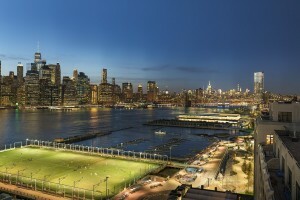 We were recently requested by our client to do some Super High-resolution photographs. Below is a brief summary of the process. The first step was to know the size expected and the area to cover. The size was provided by the client, they needed the images to be roughly 30,000 pixels in the longest dimension, and we were given a description of how much we needed to see. 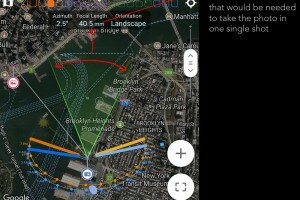 After that we used a great App called Plan-it Pro, with it we do a survey to figure out what kind of lens will cover the area requested. After finding out that roughly a 40 mm lens (on full frame) would be needed to get the coverage for the shot, we calculated the kind of lens we would need to get this coverage at 30,000 pixels wide. The logic is this, our sony A7RII takes pics of almost 8,000 pixels wide, so a 40mm lens will give us that resolution; to make however an image of approx 30,000 pixels we divided 30,000 by 8,000 (3.75), and this was multiplied to the 40mm; therefore the lens needed is 150mm. We decided to use the closest good quality prime lens available, which is a 135mm and would enlarge if needed a bit more in the post. We needed a few things to make this one photo. We knew we were doing a dusk/evening shot, so arrived at the construction site right before sunset to set up; We found the right location to set the tripod, and got all the equipment ready. When taking these types of pictures organization of files is key, as one sequence can contain about 60 images or more, and if you take several in one card, and maybe have a few other shots in between, is very hard to know where the set of 60 images starts and end. To help with that we were working in a team of two, one person was using a laptop and after every panorama was taken, the card will be copied on the laptop and a new card was used on the camera. This way we will only have one set of Panos per folder and could start organizing things on the fly and doing a few checks to make sure focus. exposure, etc were all correct when shooting. 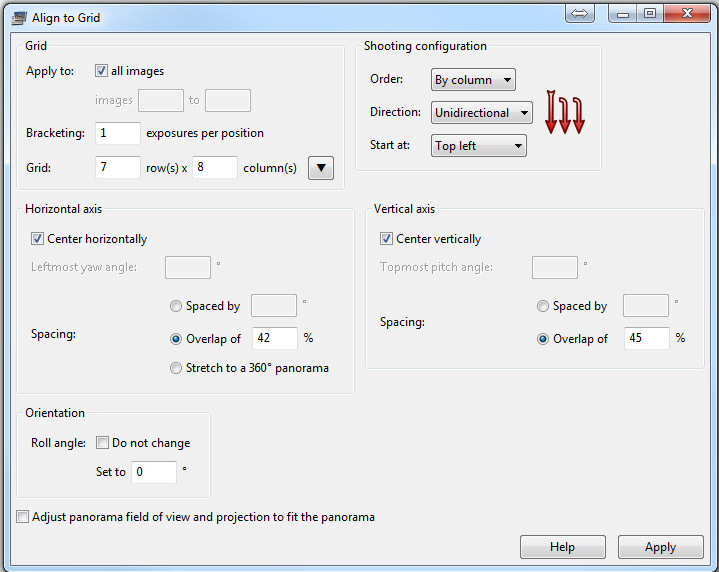 To use the GigaPan is very simple, and there are some videos explaining the process, but here is a description. 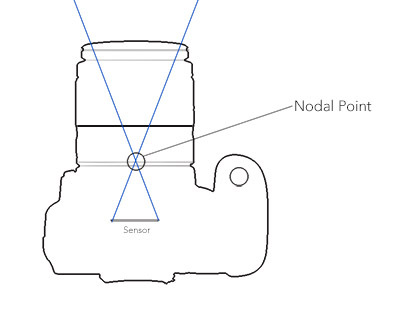 The nodal point is the exact location where the rays of light converge and invert to get to the camera sensor. The first step is to place the camera in the right location so the lens axis is aligned properly. Axis one is usually the easiest the only important thing is to have the lens center on the sliding looking from above; Axis two is a bit more difficult to line up… We used a long piece of paper bent from one side to the other passing in front of the camera to more or less figure out how height the camera should be. Next step is to align the front and back location of the camera. The GigaPan plate slides and has markings on the plate for keeping a record. 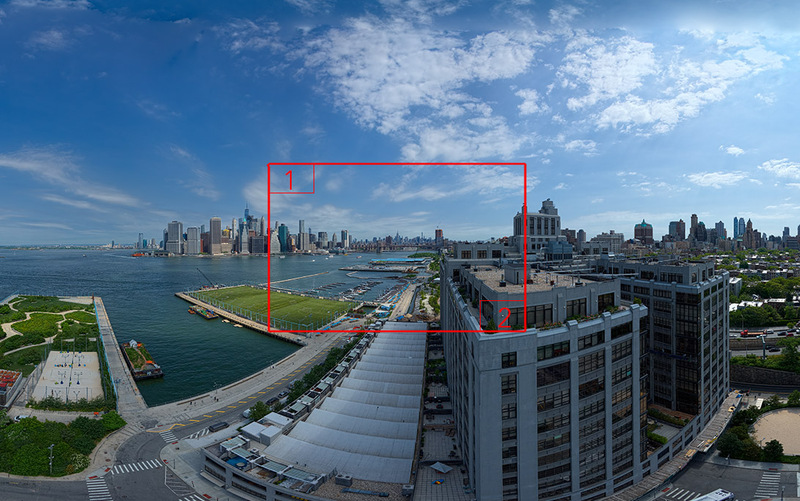 The first step is to move the camera already mounted on the GigaPan trying to find two vertical objects that can be aligned visually; the more distance between them the better. After this, one should position the aligned vertical elements on one side of the viewfinder frame, and then rotate the GigaPan (with the manual control) so that the elements move to the other side on the viewfinder. If the objects get misaligned (see above) while doing this, means the nodal point is not aligned properly and the camera needs to be moved on the front back plate. This needs to be done until the test of the vertical objects on the viewfinder stays align the whole time. 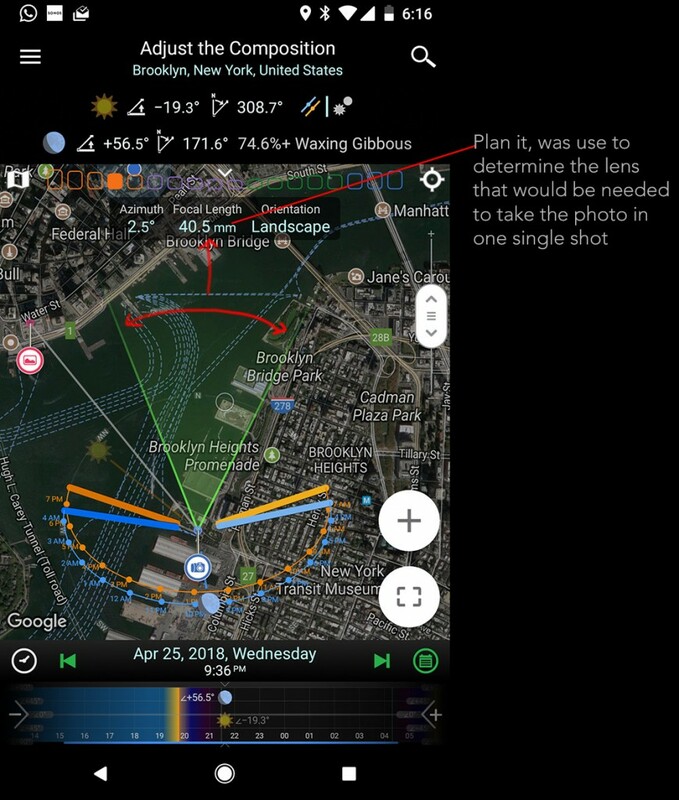 At that moment the nodal point will be aligned with the rotation axis of the GigaPan and will not move when it rotates to take all the photos for the panorama. 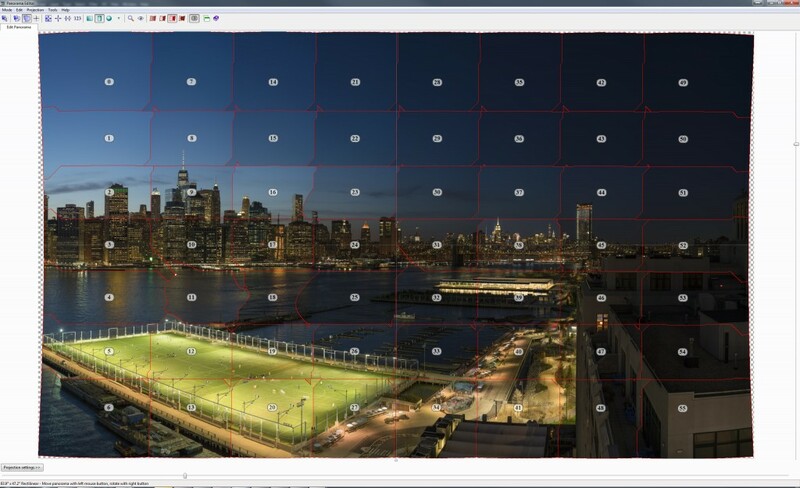 Once all of this is setup (and ideally is done before the moment you need to shoot), the way to select the panorama to take is very simple with GigaPan, the only thing you need to do is point the camera to the top left corner edge of where you want the panorama to begin, confirm, and then point the camera to the bottom right edge. 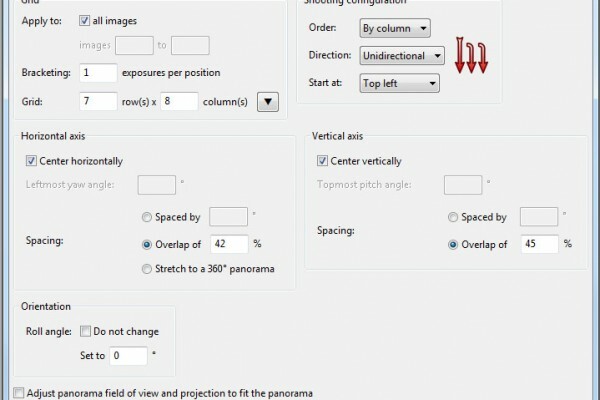 The GigaPan will help you by reminding you of some basic checklist procedures that should be done for the camera. If you are doing long exposures you may need to play with the settings on the GigaPan, you want the robot head to only move to the next position after the photo has been taken and the camera is ready to take the next. I believe with Canon cameras this process may be a bit more straightforward, but with the Sony is completely Manual. 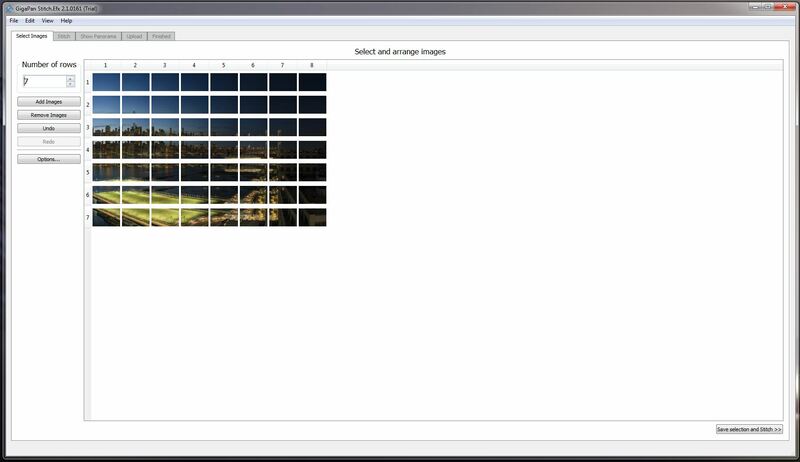 Once you have all your photos, hopefully, if you were very methodical about it won’t take long to divide each set of panorama photos into individual folders. Next is to open all the photos in Camera Raw (or Lightroom, or any other Photo Raw editor ), and verify a few things; If for instance White balance was not set correctly this can be done now to all the photos at the same time; you can also correct for some artifact like barrel distortion and Chromatic aberration, etc… the important is to do whatever you do to ALL the photos equally. 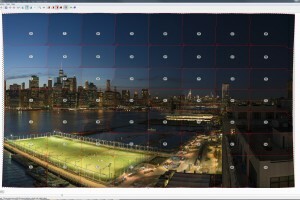 GigaPan provides a stitching software to do this, and is very capable for basic work. 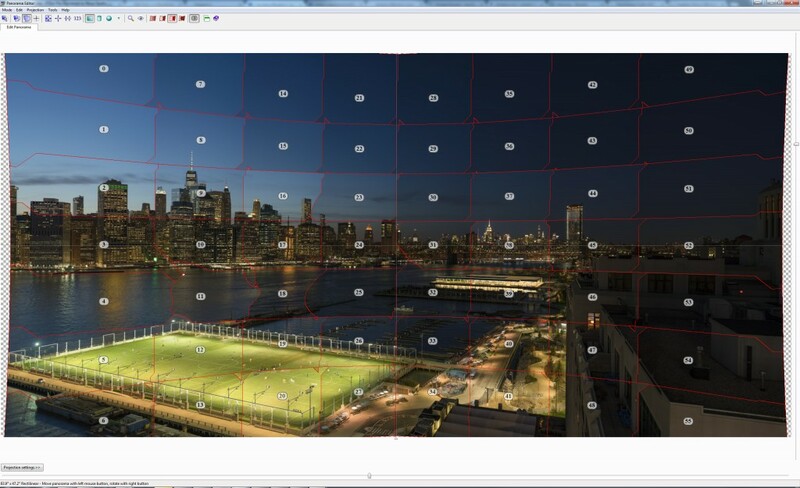 We like how quick is to see the grid of images and check that you do have all the images of the set. 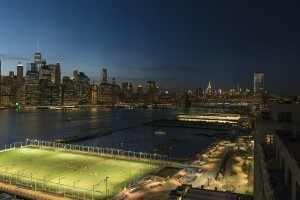 There aren’t tools for bracketed exposures to create an HDR image. 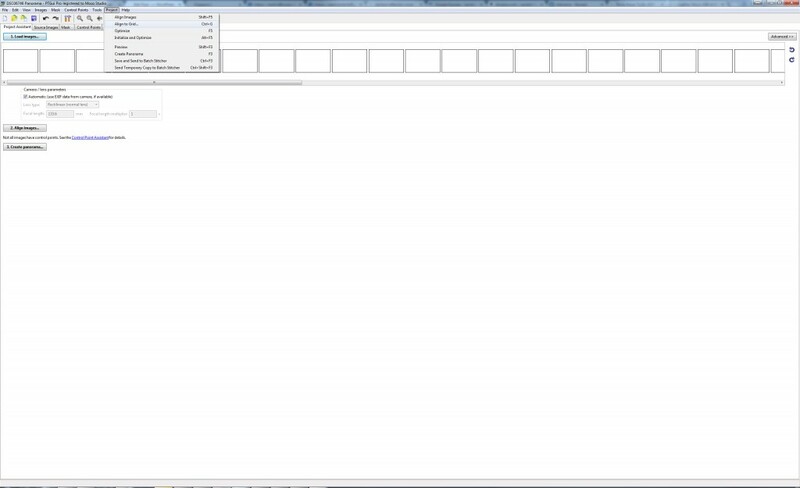 Because of this, we ended up using the great tool PTgui. The key to using it successfully is to not do a totally automatic alignment but to feed the grid info to PTgui, and let it do the rest. 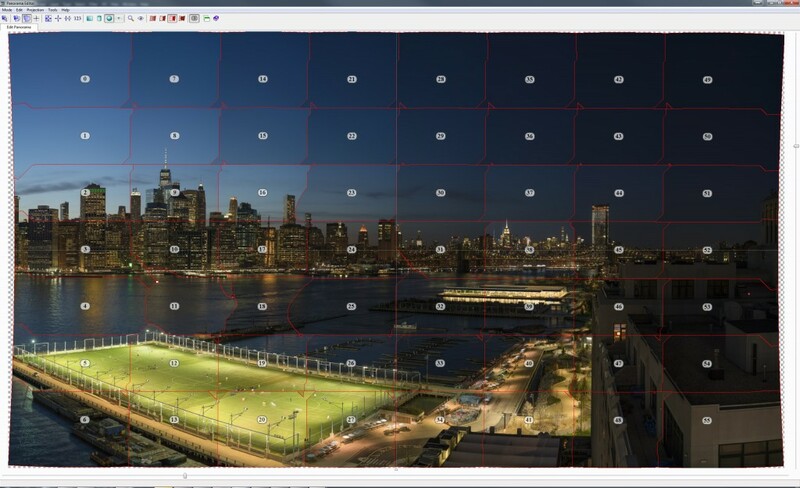 usually PTgui will detect the correct grid settings or provide you with options… usually, if this doesn’t seem to be the case you are either missing or have more photos than the ones needed. Below you can see the differences between Equirectangular, Cylindrical and Spherical ways of mapping the image. 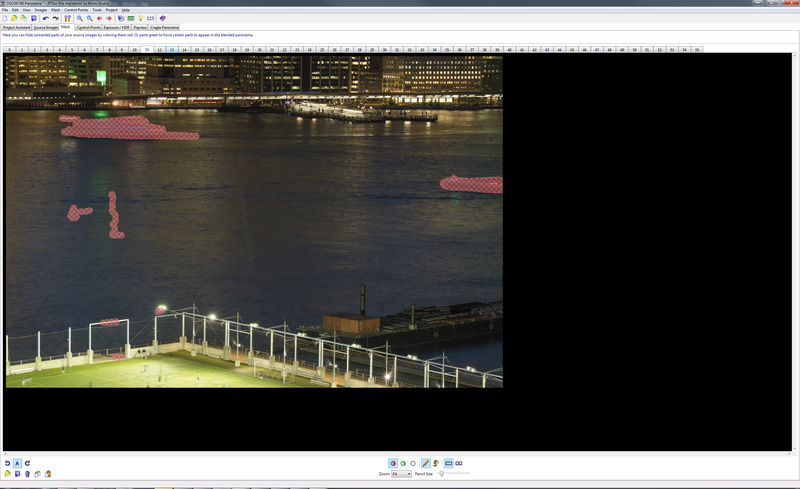 Another very useful feature of PTgui the use of masks to remove unwanted elements from a photo; if you look at the frame 11 on the grid you can see that is a bit different, this is because we masked a boat and a few other elements from this frame,and Ptgui fills this info with the adjacent frame instead. Final Step is to save the panorama from PTgui. 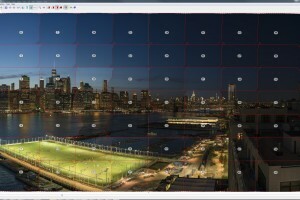 Usually, for a very large panorama like this one, some formats are not supported. We found PSB to be quite good to work with in most cases. If you are merging bracketed images then you can also use EXR but is unnecessary for 8-bit or 16-bit images. After following this process, then the image should be 95% done, however, there may be still details that need to be fixed. In this particular scenario, one of the most obvious issues was that the pano photos were taken in columns left to right and it took about 10 minutes, so by the time the last pictures were taken the sky was a lot darker, therefore three was strong variation from left to right on the lighting. Using some gradient curves in photoshop we were able to bring back a more even lighting and make the image more balanced. Also, a few construction cranes and minor stitching issues were cleaned as well. 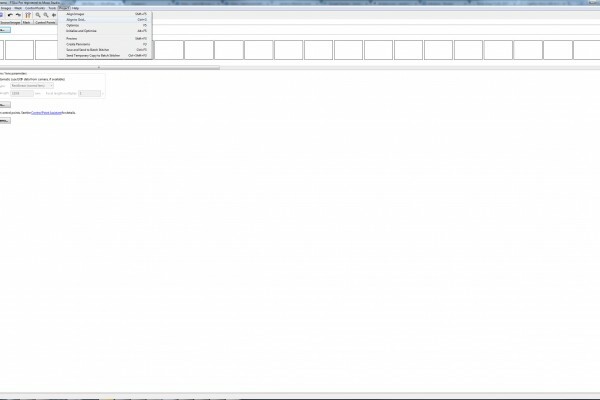 Is very time-consuming, especially considering what it takes to work with files of 50.000 pixels wide. There is also a big toll on hard drive space so be aware of that. 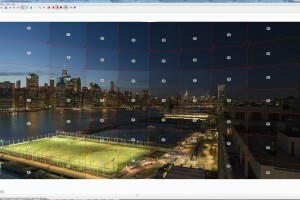 We hope this small article helps you in case you want to venture into this area of super high-resolution images. If you have any questions/comments put it on the comments or send us an email. Below is the full 50.000 pixels wide image, you can zoom in all the way to see the level of detail.